The pharmaceutical industry is among the biggest in the world, containing some of the largest companies in the world. The drugmakers are in charge of developing, making, and later marketing treatments for everything from cancer to common antibiotics. As a whole, the industry has come under fire in the past few years over the rising prices of some of these medications, especially for companies that don’t spend as much researching cutting-edge new treatments. 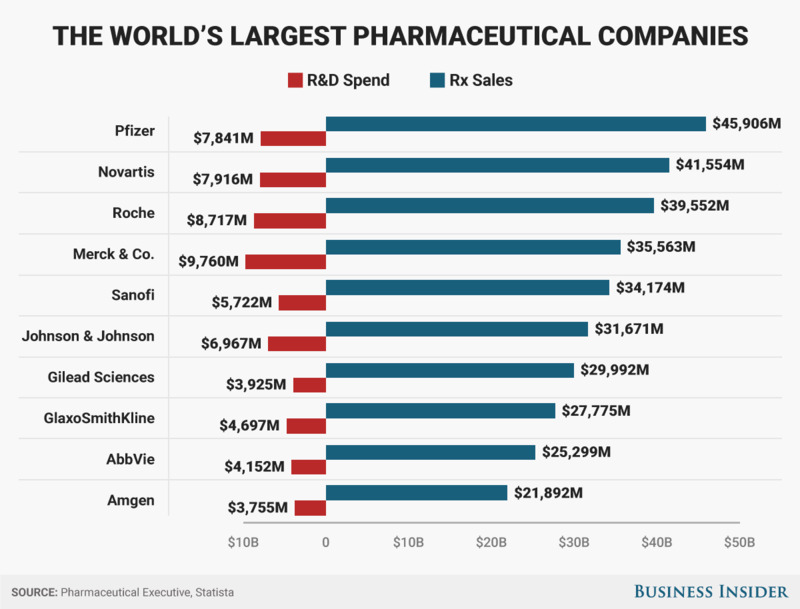 Here’s what the largest pharmaceutical companies look like, as determined by prescription sales and based on an annual ranking from the Pharmaceutical Executive. Notably, Merck & Co. spends the most on research and development at $US9.7 billion, though its sales pull it in at just #4. As a percentage of sales, Merck still spent the most on research (27%), while Gilead Sciences spent the least (13%).